What is love? Is it in the form of a role adorned by a particular person for another? Well, one cannot define exactly, as it is based on situations limited by one’s thinking and feeling. 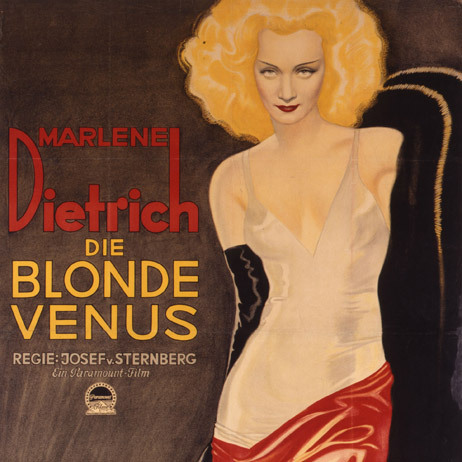 Blonde Venus is one such story where love at first sight, so to speak, hooks Helen (Marlene Dietrich), a German entertainer with an American chemist Ned Faraday (Herbert Marshall). They meet on a picnic accidentally and soon they get married. Helen is a family woman and they both have a kid; it is like any other story next door until Ned becomes unhealthy due to radium exposure at his lab. Treatment costs money and while he was being treated in Germany; to support him and the kid, Helen gets back to her profession of entertaining and soon becomes popular as The “Venus Blonde”. As the film points, she gets into an affair of sorts with the millionaire Nick Townsend (Cary Grant) in order to earn more money for the treatment. As it is left to one’s interpretation, I do believe it was a bit hard on Helen to make this choice. What’s important here is, Helen makes the choice with the best of her knowledge. She did care for her husband. And this very fact did not go well with Ned when he accidentally discovers about Helen’s affair with Nick when he returns home 15 days in advance. Unable to accept the reality, he expresses his angst at Helen. Helen flees with her kid away from Ned as he tried to separate them. She runs from one town to another before being caught by Missing Person’s Bureau. Away from her kid and her husband, she returns to her old profession in order to live the remaining days when she could have chosen to go back with Nick. It shows she wasn’t entirely interested in Nick. Infidelity can occur if one is not interested in a partner, but in this case, it was for her husband’s sake Helen made the choice of staying with Nick. But she was not interested in getting back with Nick. In her new avatar, away from family, she encounters Nick once again while on tour in Paris. There comes a time for every human to move on. It was one such occasion for Helen to move on and start a new chapter. The new chapter which she hoped to start with Nick was entwined with the previous chapters and it wasn’t easy to remove the links of the past. Upon return to America, unable to hide the fact of missing her family, she goes to Ned. Time is a great healer if one is able to understand what one truly needs. Ned also recognises the efforts made by Helen and in the end they both get together. What can one say about Nick? It wasn’t an emotional attachment of sorts with Helen. So he should be ok. From the beginning till the end, this movie is all about Marlene Dietrich who supersedes her two male colleagues for the entire duration of the movie. Released in 1932, the movie was directed by Josef von Sternberg, mentor of Marlene Dietrich, who also made a significant contribution to the style quotient of Cary Grant through this movie. He suggested Cary to have the hair style (which he retained for rest of his life) which would become a trademark and helped Cary Grant to be recognised as one of the stylish actors in the history of Hollywood.